What is Music Therapy and How do I Find a Music Therapist? This Music Therapy video answers the questions "What is Music Therapy?" and "How do I Find a Music Therapist?" 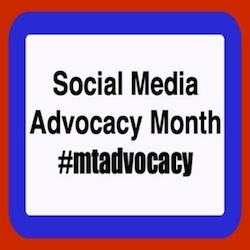 It's Social Media Advocacy Month for Music Therapy! Check out these great articles and resources below. Here are links for "How to Find a Music Therapist?" Please sign up for my newsletter full of great tips and ideas! For non-verbal children, program a big mac switch or use another Alternative and Augmentative Communication Device (AAC device) to allow them to communicate "good bye." To read a transcription of this video post please click here.